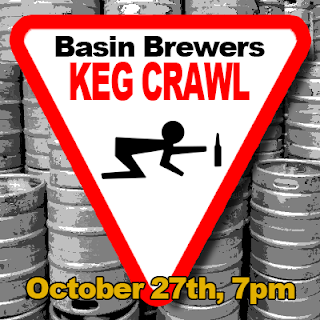 Calling all brewers, it's that time of year again, time for the Basin Brewers annual KEG CRAWL! On October 27th at 7pm, we'll rent a van and pay a designated driver to haul our asses all over Midland Odessa stopping by brewers' houses to sample their homebrew. Right now we are looking for crawl stops. If you are an active brewer and have beer ready to serve, please get in contact with us via basinbrewerstx@gmail.com or through the Facebook group. We need your help to make this a fun event, so if you've got beer ready to share, we are ready to drink!! Due to lack of participation we had to cancel this years Keg Crawl. It is a busy time of year and hard to get a good group of us together. We hope to see you at the next event! Your comment will appear after being approved by admin. Always know about events, club meetings, brew days, and special offers only available to club members! (C) 2017, Basin Brewers, Midland/Odessa, TX. Travel theme. Powered by Blogger.